– Presentation of MSI should as far as possible use the international symbols used in charts to ease the Mariners interpretation. It should be possible to assess the information and possible danger by a single look at the screen. 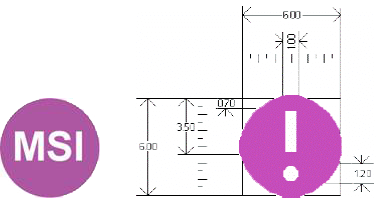 Figure 2: Suggestion of how the MSI symbol might look like, here compared to the S-52 standard symbol “new object”. is shown on ENC (see Figure 2/Example 1). When navigator acknowledges reception of message the short text is changed to MSI symbol (see Figure 2/Example 2). Figure 3: Examples of suggested MSI message presentation. Additional information can be seen by click on symbol or mouse-over. If chart symbol is not available (e.g. for drifting objects and for mine sweeping exercises), MSI symbol is shown together with short text. MSI messages covering an area are indicated by magenta lines and shaded area. Due to difficulties in the use of the international chart symbols and practical issues such as lacking symbols for a number of standard MSI messages, e.g. unlit lights, buoys off station and drifting hazards, a solution close to the above was developed for the ee-INS. It was chosen to use one symbol for presentation of all MSI messages – the MSI symbol as shown above. On board the MSI messages are received by the ship system and are presented directly on the navigation display with the MSI symbol. It is possible to access MSI text and additional information by mouse click and by mouse over a short describing text is displayed for easy assessment by the Mariner. In the vessels navigation system it is possible for the Mariner to handle received MSI, e.g. get an overview and acknowledge assessed messages. MSI messages are presented as a single point (MSI symbol only), on a line (MSI symbol and magenta line), as a point with radius (MSI symbol and shaded magenta circle) and as a polygon (MSI symbol and shaded magenta area). MSI/Navigational Warnings are received by the ee-INS via GSM or satellite (Iridium). Messages are created and kept up to date by the the Subarea Coordinator for the Baltic Sea in Norrköping and by the responsible National Coordinators today promulgating information via NAVTEX, VHF, internet, etc. When system is started the first time all MSI in force will be received by the system within a few minutes. Following first start-up updates are received every 5 minutes to make sure that the list of MSI in the system is valid at all times. MSI message positions are shown on the chart by a round purple MSI symbol and may be accompanied by a shaded area for which the message is valid, e.g. a seismic survey area. It is possible to get a short description of the message content, e.g. Buoy adrift, Light unlit or New wreck, by mouseover. To get the full text and any additional data in the MSI message it is opened by right click on the symbol and choosing ‘Show MSI details’. The list of MSI messages in force is opened by click on the MSI button in the top menu or if there is unacknowledged MSI messages in the system, on the flashing purple MSI symbol in the top menu. Newly received/unacknowledged MSI messages in the MSI list are colored red. After reading and assessing the individual MSI messages the navigator can acknowledge this by click on the ‘Acknowledge’ button. The coloring will then change to green. If there is unacknowledged messages in the list the purple MSI symbol in the top menu will flash. To find the geographical position of a MSI message in the MSI list the ‘Go-to’ function may be used. 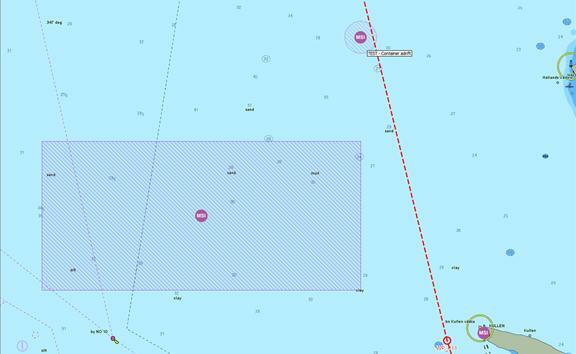 When navigating in an active route in a large scale MSI messages outside chart area but within MSI visibility range are shown by a MSI arrow symbol. To avoid display of MSI messages irrelevant to own vessels navigation, i.e. far from own ship and planned route, it is possible to apply the MSI filter. The MSI filter is turned on/off by click on the ‘MSI filter’-button. When filter is applied only MSI messages within MSI visibility range is shown. The MSI visibility ranges are set in the ‘Setup/e-Nav services’-menu (default setting: 40 nm). All MSI messages are still received by the system. If navigator wants to have all MSI messages displayed the MSI filter is simply switched off. Feedback from test users is very promising. The strengths and weaknesses of the developed MSI service has been discussed in a focus group session gathering a number of test users. The focus group included 8 active seafarers, one pilot and 7 officers and masters from three vessel types (tanker, buoy tender and passenger ferries) all part of the EfficienSea test fleet. The test users all have practical experience in use of the MSI service from their respective vessels. The focus group showed that different users have different needs, both regarding ship type, role onboard and waters navigated. The MSI service fulfills this well. The weaknesses all relate to specific details in the portrayal of MSI in the prototype; e.g. that a pop-up window hides parts of the chart area, weak chart presentation of acknowledged MSI messages and missing navigational warning ID number when displayed on chart. The strengths identified by the focus group are linked to the overall concept of making MSI messages available to the Mariner on the navigation system automatically; e.g. the go-to and filter functions, receiving updated information on chart display and that it actually makes the Mariner read the MSI messages. Also discussed was the overarching demand that the data (server, shore info) has to be completely reliable or it will have negative impact on use of services. Not knowing about reliability lowers usability. All participants were of the opinion that the MSI service is valuable and should be developed further. The service is filling a current information gap and if the weaknesses are worked with, the service will improve and assist the navigators in their daily work. In a following expert walkthrough with two navigators using a prototype, the general consensus was the same as above. The service is useful and the comments and feedback all regarded redesign to make it even more so. Some comments regarded pure design features such as input fields; others were about the interaction with the service. Most of these suggestions can be easily handled. The conclusion is that the underlying service is valuable, and can be even better with a little redesign.